Gattacicova’s first edition is a book on the Southwark Lido, published with the participation of The Architecture Foundation, EXYZT and Solid Space. 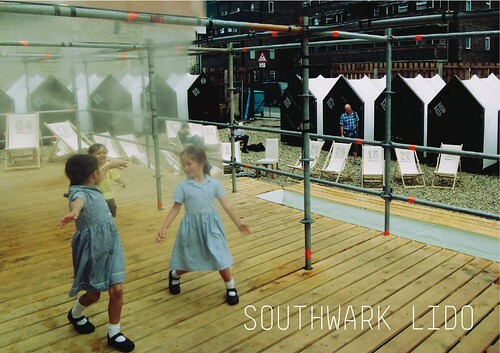 Following the success of EXYZT’s Southwark Lido in 2008, which attracted much positive feedback from visitors and residents alike, we have published a book of images and texts on the Lido. The book will be on sale from 22nd July 2009 for £10 per copy, plus p&p. You can also purchase copies at a solidarity price of £20 per copy; all proceeds will be invested in future publications. The book consists of 108 printed pages, full colour throughout, with brief texts from participants and photographs. The graphic design is by Directeur Général, part of the EXYZT collective, who gave the Lido its graphic identity. It is printed by eco-printer Foxprint. It includes pages exploring the Southwark and South Bank area, the collaboration with local organisations, building the Lido, the potential for ephemeral architecture in sites in transition, and the constructive relationship between Solid Space, EXYZT, the London Festival of Architecture and The Architecture Foundation. First edition of 600 copies.